How does WiFi campaign work? Every WiFi network enables to track, locate and enagage with customers in real time as soon as customer enters its range. Bleesk determines user’s mobile device position based on the signal from a WiFi router and allows to send messages to smartphones when they are in the range of it (iOS users need to be logged in to the WiFi network to receive messages). To identify the correct WiFi network as a trigger you need to provide a name of the network (SSID) and WiFi MAC Address (BSSID). What is the difference between Beacons, Geofence and WiFi? WiFi enables access to the internet by using radio signals. Each WiFi router can be in fact treated as "a beacon" and trigger certain actions in a mobile app - for example show a personalised greeting or offer a discount when a customer enters a venue. WiFi signals are much stronger than those that beacons have and therefore can cover larger areas, both indoor and ourdoor. 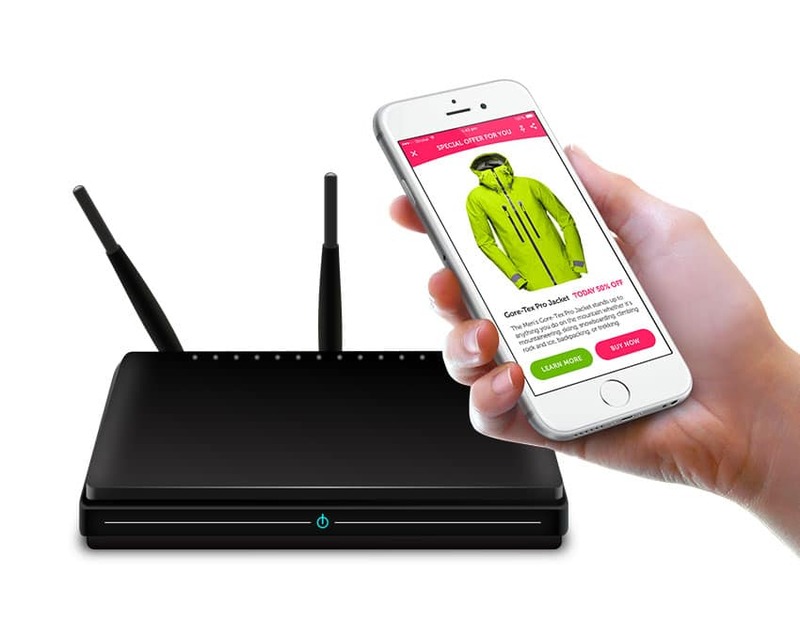 The pros of creating a WiFi campaign is that you do not need to invest in any new hardware as most of retailers already have a router at their venue. You don't need to worry about a short battery life as each router is always plugged into a socket. Campaigns that are triggered by WiFi spots work on both iOS and Android. The only difference between two systems is that on Android all you need to do is turn on WiFi on your device, whereas on iOS you need to be logged in to a designated WiFi network. When should I use WiFi campaign? WiFi is a perfect solution if you have a small venue with an active WiFi network and you do not want to spend money on new hardware - your router is all you need. Taking into account the signal strenght, WiFi is more reliable than the signal provided by beacons but you won't be able to achieve similar level of precision, as WiFi networks usually cover large areas whereas beacon campaigns can have precision up to 1 meter. WiFi campaign is also useful if you want to make sure that people will have bluetooth turned on to receive beacon proximity campaigns in your venue. You can simply create a WiFi campaign that triggers a notification reminder "Turn on Bluetooth to receive more special offers". This significantly increases conversion rates for beacon campaigns. WiFi, Geofence and Beacons complement each other, so that you can use a variation of them at the same time.